After a failed attempt at going to Iggy's Doughboys and Chowder House in Warwick, RI, Mom and I turned the tables and decided on comfort food instead of seafood. Last month, we had visited the Cracker Barrel restaurant in Wrentham, MA, but forgot to bring the camera. Now that the camera was safely in my pocketbook, it seemed like the perfect opportunity to drive up three more exits and visit the Cracker Barrel on New England Boulevard in Coventry, RI. We arrived at just about 4 p.m.
After walking through the row of rocking chairs that were placed out on Cracker Barrel's "front porch," we entered through the main door and arrived in the gift shop. 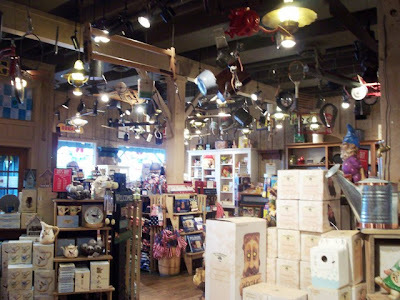 Cracker Barrel cleverly places its restaurant behind the gift shop so that patrons are tempted to shop both before and after their dining experience. Trying not to look at anything too distracting, Mom and I passed by all the adorable chachkis and headed toward the hostess station. We told a uniformed waitress that we wanted a table for two, and she quickly showed us to one. Left with two sets of paper menus - one for breakfast and one for lunch/dinner - Mom and I started to browse through all the delicious options. We were soon greeted by our waiter, Brian, who took our drink order. Both Mom and I always go for the Diet Stewart's root beer, so we ordered two of those. They quickly arrived in glass bottles and were accompanied by two frozen mugs. After telling Brian that we still hadn't made up our minds, he left us alone so that we could narrow down our choices. Finally, we were ready. Mom ordered the meatloaf dinner ($7.99) which came with three sides. She chose applesauce, mashed potatoes (without gravy), and corn. I went with the half-pound bacon cheeseburger ($7.69) which came with lettuce, tomato, pickles, mayonnaise, and a side of fries. I asked for my burger to be cooked medium well. Brian took away all of our menus while Mom and I took a look around at this chain restaurant's crazy interior. What's not on the walls here? Seriously, if it's kitschy and old-fashioned, it's probably nailed to the wall inside Cracker Barrel. From where I was sitting I could see washboards, checker sets, lunchboxes, guitars, irons, Singer sewing machines (not hanging on a wall, obviously), old advertisements, fishing and farming equipment, horseshoes, mounted fish, jugs, pans, hunting tools, and much more. I love this place! It's like a trip back to the old days, and the large fireplace and bluegrass music playing in the background only helps with the time travel. 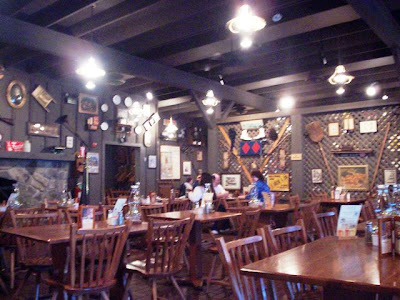 There aren't any booths at Cracker Barrel, and all of the wooden tables are topped with old-fashioned oil lamps. There is also this little game on every table. It is a wooden triangle with several holes filled with pegs - all except one. The object of the game is to jump each peg to see how many you are left with. If you're left with just one - you're a genius! I've never been able to do it, but apparently today was my lucky day because on the last game I committed myself to, I won! I knew I was a smart cookie. Just as Mom and I were marveling at the fact that there were actually tables available (Cracker Barrel is ALWAYS crowded), a gentleman and his wife came in and sat at the back by the windows. As he placed his order, he made sure to ask the waiter if his steak would be a good size, or if he would have to look for it on his plate. Mom and I just laughed. I spotted Brian bringing over our dishes. Both platters looked fabulous. 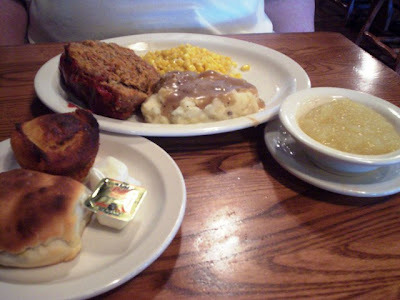 Mom's meatloaf plate also came with a biscuit and a corn muffin, which she said were great. As she dug in, I asked Mom how everything else was. She said that her meatloaf was thick and nicely spiced with onions and peppers. It was quite a substantial piece! The sides were great as well. Although the mashed potatoes came with gravy when she asked for none, she did not make a fuss and said that everything tasted just fine. The corn nibblets were good, and the applesauce was nicely chilled and tangy. Her whole meal was very filling and delicious. My burger was great. I almost never order a burger when we go out to eat, but today I was just in the mood for one. The layers of Colby cheese melted nicely over the pattie, which was cooked just to my liking. The bun was soft, the veggies were fresh, and even the cole slaw was very tasty. The bacon gave the burger an extra jolt of smokey flavor, which I thoroughly enjoyed. 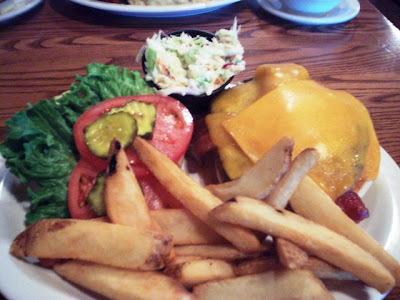 I've had this burger once before on my first trip to Cracker Barrel, and this one was just as good. Since we've been to Cracker Barrel a few different times, we've had the opportunity to have both breakfast and lunch here. 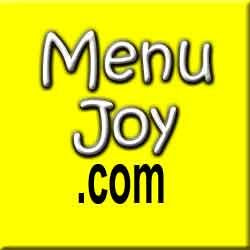 Unfortunately, I forgot to grab a take-out menu on the way in/out, so I won't be able to list the prices. However, I will be able to recommend a few things. For breakfast I've had the biscuits and gravy and Montmorency cherry pancakes which were out of this world, while Mom's had the pecan pancakes that were heavenly as well. I've also been lucky enough to try the strawberry lemonade which was cool and tasty. For lunch, we've both tried the chicken salads which were served with a boiled egg (yuck for me, yum for Mom) and wedges of Colby cheese. It was fresh, crisp, and quite tasty for a salad. For dessert, we've tried the chocolate cobbler. It was sooo delicious. Topped with hot fudge, pecans, and whipped cream, the cobbler was served in a little mug. How quaint! Enough about us. If you're in the mood for something hearty, then Cracker Barrel is the place to be. Daily features start at 4 p.m. and include fried pork chop Mondays, butter baked chicken Tuesdays, broccoli cheddar chicken Wednesdays, turkey n' dressing Thursdays, fish fry Fridays, chicken n' rice Saturdays, and homestyle chicken Sundays. Other comfort foods include country fried steak, roast beef, farm-raised catfish, ribeye, and chicken tenderloin. After getting some change, I returned to the table to get Mom and to leave $5 on the table for Brian for his great service. Before leaving, Mom and I checked out the ladies' room. Normally filled with frantic people, the restroom was clean and quiet. Both Mom and I enjoy the fact that the bathroom always has hand lotion available. As we exited the restrooms, we took a look around the gift shop. There were several T-shirts, sweaters, knitted blankets, old-fashioned candies and chips, toys, games, DVDs, candles, and lawn decorations that were overpriced, but adorable. I'm not sure if they've had a problem with shoplifters in the past, but the two most recent visits to Cracker Barrel kept Mom and I under the watchful eyes of the gift shop staff. I hate people who steal from gift shops. That's why everything has to cost so much. Leave things alone! We first visited a Cracker Barrel on an old-lady bus trip to Yankee Candle/Holyoke Mall some years back, and ever since then each time we visit one, we feel like we're on a trip. Maybe it's because the gift shop sells so many travel items (games, books on tape, etc. ), or maybe it's because so many tourists stop here to grab a quick bite before getting back on the road. Either way, Cracker Barrel is a great place to eat and reminisce about days gone by. 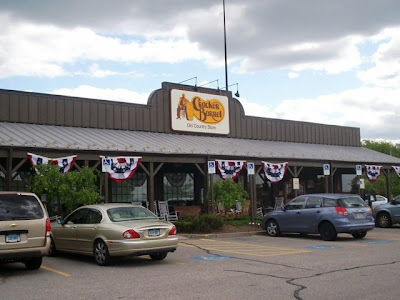 Cracker Barrel in Coventry (401-827-8015) is located at 825 Centre of New England Blvd. General hours of operation are 6 a.m. to 10 p.m. Sunday through Thursday, and 6 a.m. to 11 p.m. Friday and Saturday. For a location nearest you, please visit www.crackerbarrel.com.